Painting Oil on Canvas | 16" x 24"
I sway from monochrome to colours, from fantasy to reality. My works are an art of discovery; Every time I hold the brush in my hand, I set sail on a journey away from this illusion of a reality and deeper into my own world. Through my compositions I bring my life experiences, emotions with a splash of myths and mystery. My style, the lines, the forms come spontaneously. The ethereal beauty of temple sculptors, especially south Indian temples are a great inspiration to me. 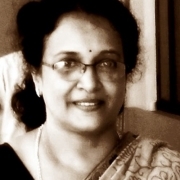 Raji Chacko, hails from Bangalore, Karnataka. A graduate of law, she studied art under eminent artists of Delhi. She has been a part of various group shows in the country and her works are a part of the collections of the Maharaja of Mysore and the High Commissioner of Sri Lanka. Her compositions brim with culture, emotions and life. Her style is spontaneous and she is inspired by temple sculptors.